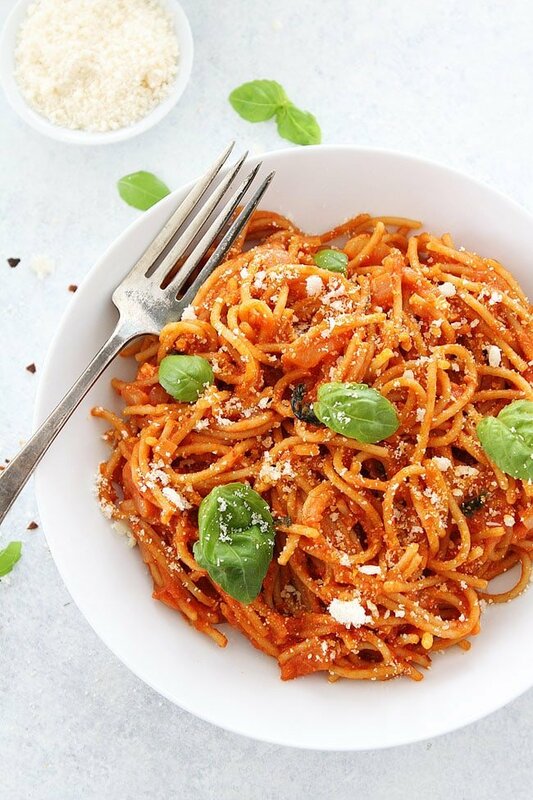 Pasta Pomodoro Is a simple pasta dish with a delicious tomato sauce, fresh basil, and Parmesan cheese. This quick and easy meal is a family favorite and a great weeknight dinner recipe. 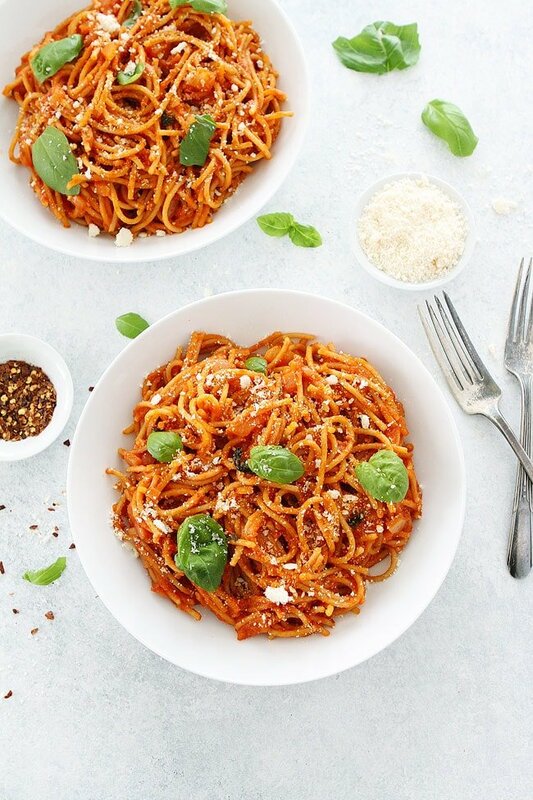 Pasta Pomodoro, don’t you just love saying that? I love saying it and eating it. It sounds fancy but it is SO easy. This easy pasta dish is one of my all-time favorites. We make this pasta at least twice a month. It is a weeknight dinner lifesaver. Pomodoro means tomato in Italian so it’s basically pasta with tomato sauce. It is a classic Italian dish that is made with simple ingredients…and that is a GOOD thing! Sometimes simple is best and that is SO true about this dish. How Do You Make Pasta Pomodoro? Very simple ingredients, that you probably always have on hand. YAY! 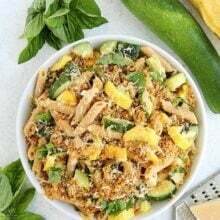 I am telling you, this pasta recipe is a dinner lifesaver! First, make sure you use quality ingredients. There aren’t very many ingredients so you want to make sure all of the ingredients are high quality. We use canned tomatoes for this recipe, but ONLY San Marzano whole peeled tomatoes. They are the BEST canned tomatoes. Make sure you use them to get the best flavor for the tomato sauce. Puree the tomatoes in a food processor or blender before you get started. We use spaghetti, but you can use bucatini, angel hair, or fettuccini. We love DeLallo’s pasta! Add a little crushed red pepper flakes to the sauce to give it a little kick. If the kids are going to eat it, you can leave them out, but our boys are fine with a little heat. Make sure you reserve 1/2 cup of the pasta water so you can add it back into the sauce. Don’t miss this step. Add a little butter to the pasta at the end. You only need two tablespoons, but those two tablespoons make a big difference. The butter adds a richness to the pasta. Don’t be skimpy with the fresh basil and Parmesan cheese. Also, buy the GOOD Parmesan cheese for this recipe. 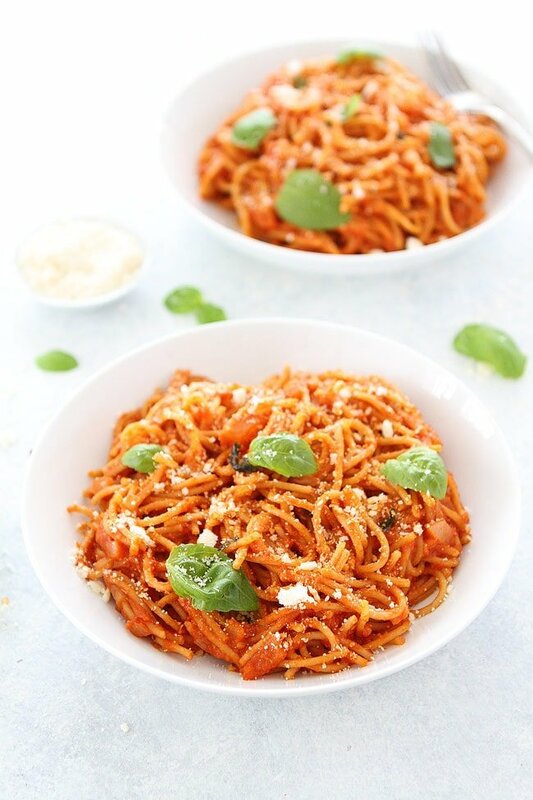 If you are looking for an easy weeknight dinner recipe, give Pasta Pomodoro a try! It is also a great recipe for easy entertaining. Serve a simple green salad and garlic bread on the side. Everyone loves this classic pasta dish! 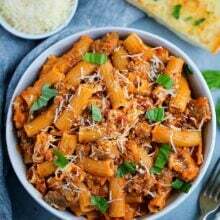 This easy Italian pasta dish is a family favorite and easy to make at home. It is perfect for an easy weeknight meal or easy entertaining! In a large skillet, heat the olive oil over medium heat. Add the onion and cook, stirring occasionally, for 10 minutes or until the onion is soft. Add the garlic and red pepper flakes and cook for 3 minutes. Stir in the puréed tomatoes and season with salt. Cook the sauce until it starts to thicken, stirring occasionally. This will take about 20 minutes. When the sauce has thickened, stir in the fresh basil. Place the pasta back in the large pot, add the tomato sauce and hot pasta water. Stir until the sauce coats the pasta. Add butter and Parmesan cheese and toss until butter and cheese are melted. 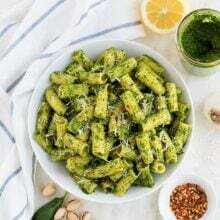 Plate the pasta and garnish with basil and Parmesan cheese, if desired. I agree San Marzano tomatoes make such a big difference. Especially in a dish like this were the tomato shines! Classic dinner, so simple and spectacular! 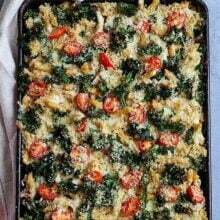 Just made this for dinner tonight and just might be my new favorite pasta dish! The sauce has great flavor, and just a hint of spice from the red pepper flakes. Absolutely delish! Will be a staple in our house! Thank you!!! Never heard about this one before, gonna add to the list of “to cook” for this month. Thanks! It looks so yum! Thank you for sharing the recipe! Love the secret for the best pasta pomodoro. Gonna try it soon. I’ve been looking for a good Pomodoro recipe, so I’m glad I stumbled onto this one. Will definitely be giving this a try!! SO yummy! Not only is this dish delicious but it was extremely easy to execute. The use of red pepper flakes really adds an extra punch. Such a simple recipe yet tastes so much more complex than just pasta and sauce. I started making this a few months ago and it’s become a regular in my dinner rotation. It’s so good and so easy. 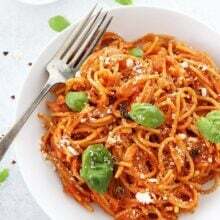 Up until finding this recipe, most of my children, refused to eat spaghetti (they still won’t eat any other recipe) but this is a favorite of every child. A hard spot to earn at my house. Thank you for making it so we can finally eat spaghetti. I can’t eat store bought sauce anymore though. Hi I have a quick question, I hate eating anything out of the the can, can I just use the normal tomatoes ( good quality) and purée it? Sure, if you have fresh tomatoes you can use them. Ps. I think this recipe would definitely be family-friendly so we’re going to make it next time we have our little nieces over too. So happy you loved it! Our family loves this recipe!